Rumors persist that the Knicks have promised to take Stephen Curry with the No. 8 pick. I saw Knicks president Donnie Walsh at the draft lottery, and he was pretty adamant that they didn’t mean to make a promise to Curry. When Curry was going through the process of deciding whether to declare for the draft, the Knicks relayed that they liked Curry and would consider him at the No. 8 pick. But it wasn’t a guarantee. There are too many scenarios in this draft — one of which was that back then, the Knicks didn’t even know where they would be drafting. However, I don’t think there’s any dispute that they are big Curry fans, and if the draft goes according to form, he’s the likely pick for the Knicks. This is going to be convoluted but, the way I see it at the moment, there are four players that presently seem like locks to go before the Knicks pick: Griffin, Rubio, Thabeet and Harden. After that group there’s a second tier of players that includes Hill, Jennings, Evans, DeRozan, Curry and Holiday. And even though I included him in the second tier, I’d be shocked if Hill is still avaiable at 8. Of the remaining players, I expect DeRozan’s, Holiday’s and possibly Evans’ stock to rise during workouts. The point I’m trying to make is that, if I’m right about those 5 players being locks for the top 7, there’s really no scenario in which the Knicks don’t have one or more of Curry, Holiday, or DeRozan sitting out there for them to take at 8. And even if I’m wrong, that means that one of those top 5 players is going to fall into the Knicks’ laps. So the Knicks are in a pretty nice position. Work-outs serve a purpose. But for the most part, I think if you wait until work-outs to narrow the field for you, you’re probably making a mistake. Chad Ford was down on Thabeet all year, questioning his athleticism and strength. He watches him in one work-out and says that with some practice, all of a sudden he can be the next Mutombo. 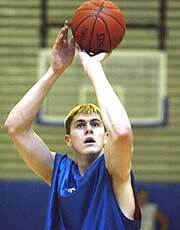 Incidentally, Chad also was huge on Darko, raving about how the kid could shoot left handed threes without jumping during workouts. A lot was also made about how Kwame Brown dominated Tyson Chandler in work-outs. The point I’m getting at is that for most prospects, like Thabeet for example, there is at least a full season of game action to use in evaluations. I have a feeling that Donnie Walsh, who scouted Steph Curry extensively, watches actual games in deciding which players he likes. I doubt he’s ever flustered by a work-out. By the time work-outs happen, a saavy GM probably already knows that he likes the guy he’s invited to the gym. The work-out is like a getting-to-know-you session. Are you a sociopath? A nice guy? Smart? Obstinate? Sociable? As into us as we’re into you? Oh, and lets see that jumper we know so well from watching you play in games for over a year. That’s why I don’t totally discount the Steph Curry promise even though people have called it ludicrous to suggest the Knicks made a promise before workouts. In Chad’s article, he completely changes his tune about Thabeet because he canned a few jumpers in a workout. What about the entire season of games Thabeet played. Doesn’t that tell you more about the kid than one work-out session? Chad Ford: (1:07 PM ET ) No way. Isiah Thomas is gone. That alone should count for something. They moved Zach Randolph’s horrendous contract. They hired the best coach in basketball, Mike D’Antoni. And they got terrific performances from a few of their young players like David Lee and Nate Robinson. When you look at the big picture, the Knicks are finally heading in the right direction. When’s the last time you could say that? Too true Chad, too true. Surprisingly, he failed to give Isiah any credit there for winning only 23 games and thus leaving Donnie Walsh with the 6th pick in last year’s draft. Dan (Boston): If Davidson misses out on the Tourney does Stephen Curry drop out of the lottery or is he inevitably going to be taken by NY? Chad Ford: (1:37 PM ET ) I think the Knicks and Bobcats both love him. I don’t see him slipping much further than that. He’s perfect for D’Antoni’s system and Knicks fans would love him. I tend to agree with Chad’s take. What he doesn’t mention is how much LeBron loves Stephen Curry, and even goes out of his way to watch him live.